The majority of undergraduate texts in invertebrate zoology (of which there are many) fall into one of two categories. They either offer a systematic treatment of groups of animals phylum by phylum, or adopt a functional approach to the various anatomical and physiological systems of the better known species. The Invertebrates is the first and only textbook to integrate both approaches and thus meet the modern teaching needs of the subject. This is the only invertebrate textbook to integrate systematics and functional approaches. The molecular systematics sections have been completely updated for the new edition. Strong evolutionary theme which reflects the importance of molecular techniques throughout. Distills the essential characteristics of each invertebrate group and lists diagnostic features to allow comparisons between phyla. New phyla have been added for the new edition. Stresses comparisons in physiology, reproduction and development. Improved layout and illustration quality. Second edition has sold 14000 copies. R. S. K. Barnes is the author of The Invertebrates: A Synthesis, 3rd Edition, published by Wiley. 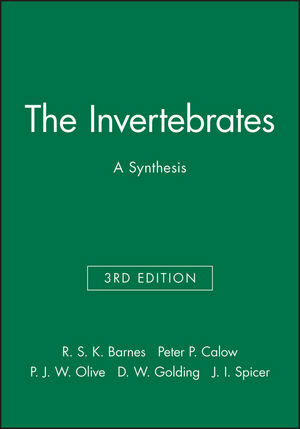 Peter P. Calow is the author of The Invertebrates: A Synthesis, 3rd Edition, published by Wiley. 1. Introduction: Basic Approach and Principles. 2. The Evolutionary History and Phylogeny of the Invertebrates. Part II: The Invertebrate Phyla. 3. Parallel Approaches to Animal Multicellularity. 8. Invertebrates with Legs: The Arthropods and Similar Groups. Part III: Invertebrate Functional Biology. 10. Mechanics and Movement (Locomotion). 12. Excretion Ionic and Osmotic Regulation and Buoyancy. 14. Reproduction and Life Cycles. "I can not recomment this book highly enough. It should be in the library of every school and university and I think all biologists would benefit from having a copy in their personal collection."